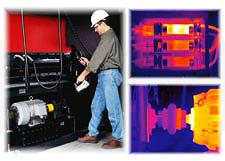 Thermographic analysis provides a high-resolution, non-contact means of monitoring the condition of electrical and electromechanical equipment, roofing and wall insulation, and refractories. A detailed report is submitted including electrical anomalies found with colour photo documentation, infrared images, summaries of problems and corrective actions to be taken. 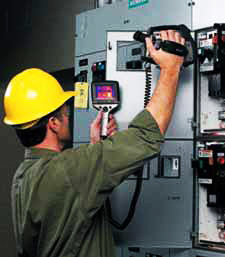 Inspections of Electrical Systems such as transmission lines, distribution lines, switchboards, transformers, circuit breakers, electrical panels and cables. Inspection of Mechanical Systems such as turbines, paper machines, motors, pumps, fans, heat exchangers, cement kilns, conveyor belts, and bearings. Inspection of Machine Structural Integrity such as boilers, chimneys, refractories, furnaces, flares, storage tanks, and pipes.